Grabbit® Sewing Tool Caddy™ keeps everything within reach while you hand or machine sew. Transport all your needed sewing and quilting tools from place to place with its comfortable carrying handle! Organize tweezers, markers, scissors, seam ripper, needle threader or any important items in five spacious tool holes. Spools of thread and bobbins are held on two spindles. A powerful magnet holds clipping scissors or even full size cutting shears with the handles out ready to grab. Your Grabbit® Magnetic Pincushion nestles securely into a specially made tray. 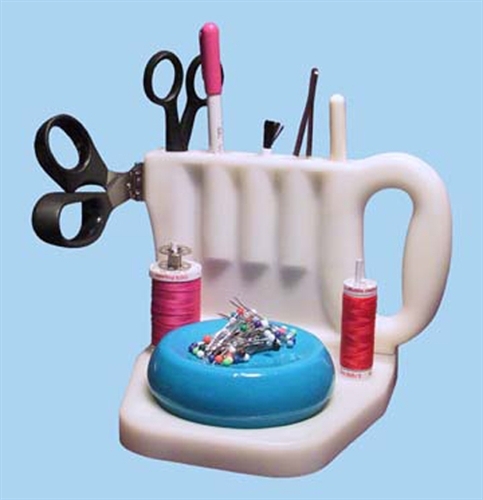 Grabbit® Sewing Tool Caddy™ can be adjusted to accommodate personal preference. It comes assembled with the handle to the right. Made of two sections, it can be reassembled easily with the handle to the left, using a screw driver. You can determine the best configuration for you!